My summer semester at SFU has finally come to a close, and to celebrate, my dad offered to take the family to sushi somewhere in Surrey. Kami Sushi sprang to mind, and I told my dad the addresses for both of their locations. He ended up choosing the one in South Surrey (the Grandview Corners one) in order to avoid the direct glare of the sun from the west. Now, from the outside, Kami Sushi looks like just another cheap sushi joint. I really wish they could do something to make the outside of the restaurant match the ambiance of the inside. 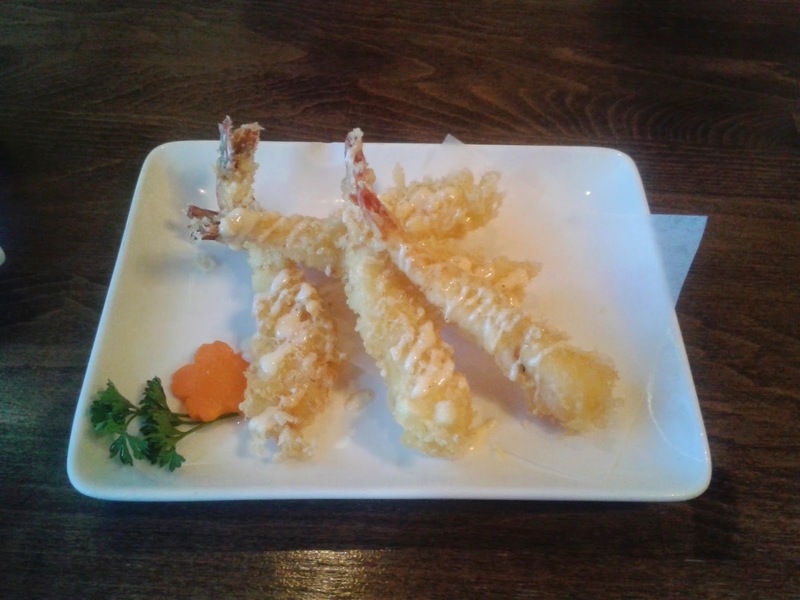 The Ebiyonnaise consisted of 5 tempura prawns with a lemony mayonnaise sauce. The prawns were served hot with a slight amount of lemony mayonnaise drizzled over them. The mayonnaise added some desirable sweetness to the prawns, but I would have preferred more of it. The batter on the prawns was flaky, crunchy and a bit too thick, while the prawns themselves were sufficiently voluminous and fresh. 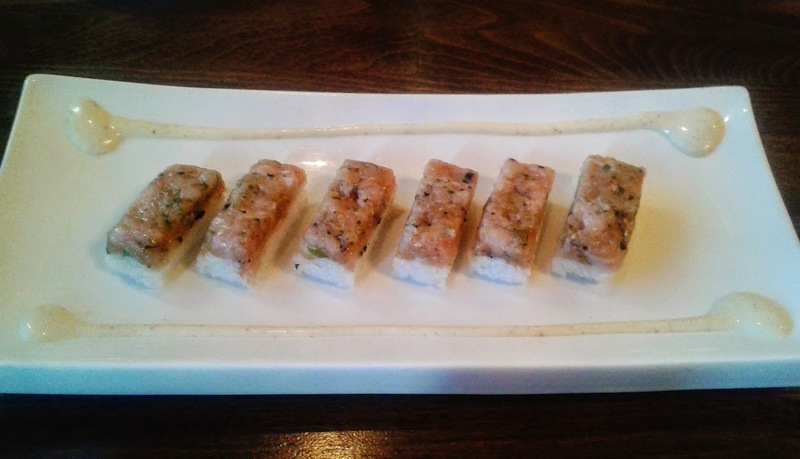 The Fighting Shrimp Roll came with shrimp tempura and crab crowned with cooked shrimp. They were quite generous with the cooked shrimp on top, and they also did a good job of making sure that the cooked shrimp retained a soft, bouncy texture. The shrimp in the tempura had almost exactly the same texture as the cooked shrimp. The slightly sweet teriyaki sauce helped to bring out the flavour of the shrimp and was sufficient in making the crab meat and avocado quite savoury. The Negitoro came with 6 pieces of negitoro nigiri sushi. I was most impressed with the sushi rice, which was compact, but remained soft and not mushy. The toro was mashed and was very soft, while the onions were chopped into pieces small enough so that they added flavour but did not intrude with the softness of the toro. 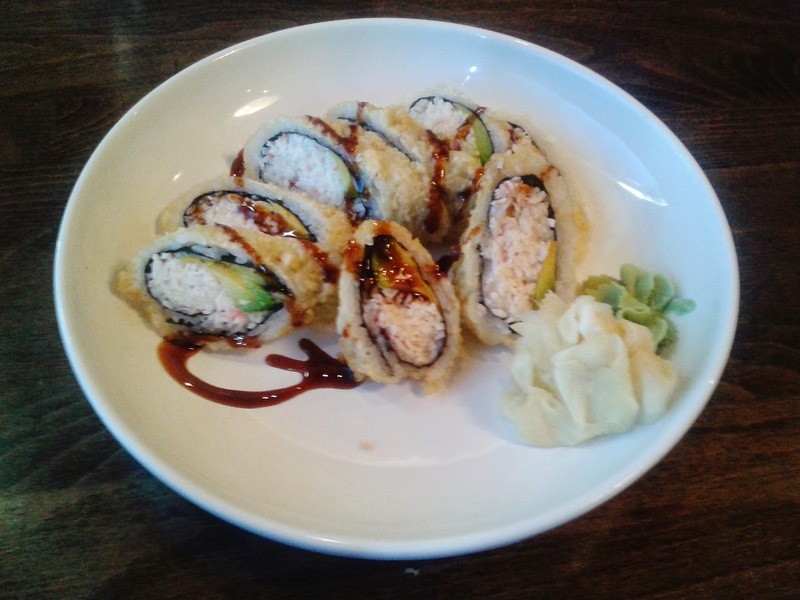 Deep-fried California rolls aren't my thing, but this was one of the best ones I've had. The tempura batter was crunchy, but was thin enough to remain soft. I also liked how the crab meat was not mushy, as is often a problem with deep-fried California rolls. The roll was also cut slanted to increase visual appeal. This dish was named Mary Kim, and I wasn't quite sure why. Did Mary Kim come up with this dish? Was this dish designed in honour of Mary Kim? Or did someone decide they wanted their name to show up on the menu but couldn't decide where? 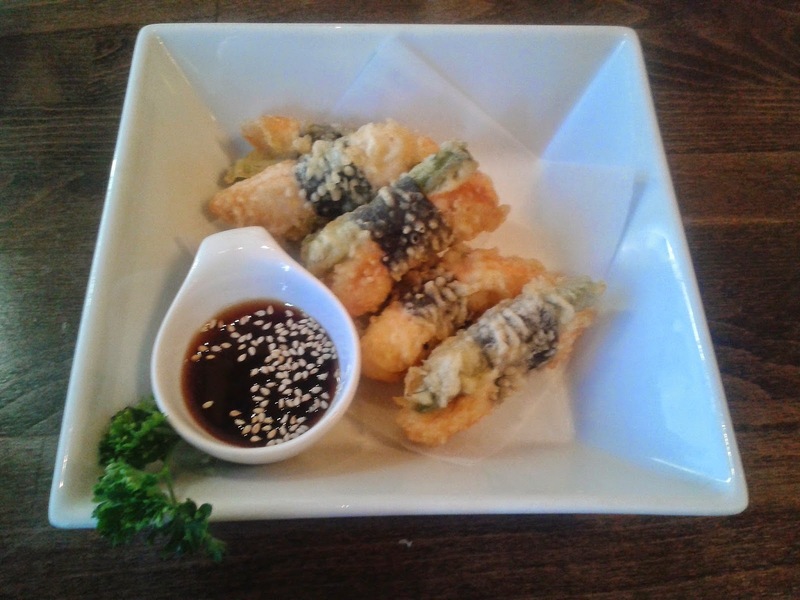 In any case, Mary Kim consisted of salmon and asparagus wrapped in seaweed and then deep-fried. The sauce that came with it had an unusually thick consistency, and resembled a mixture of teriyaki sauce and soy sauce. The asparagus was soft and juicy. Unfortunately, the asparagus and salmon cancelled each other out. Maybe Mary Kim can re-design her dish so that it contains three pieces of asparagus tempura and three pieces of salmon tempura? I'm always tempted to read this as the Snow White Roll, particularly because of the Disney font used on the menu. 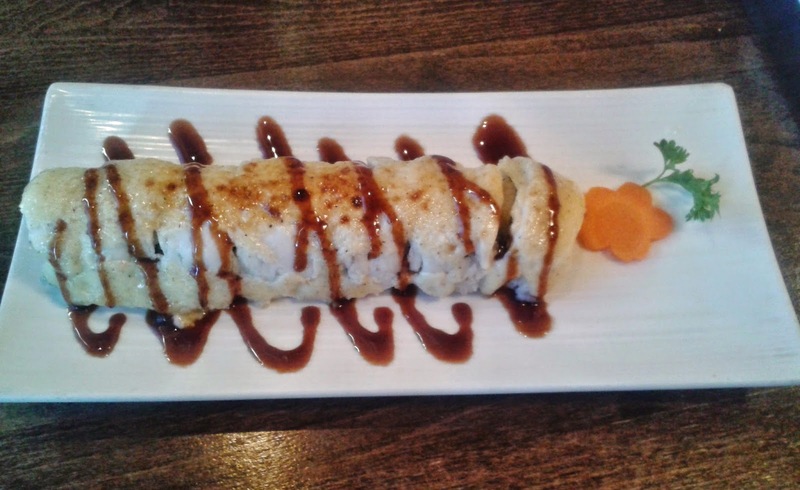 The Snow White Roll (oops! 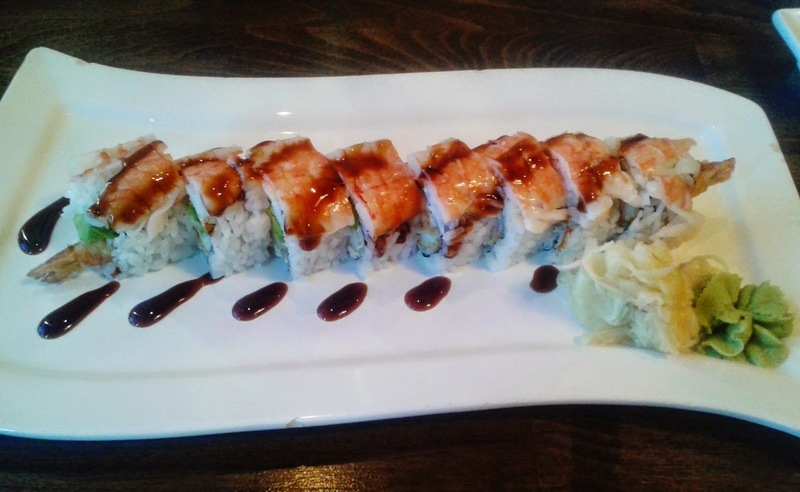 I meant White Snow Roll) consisted of a California roll topped with red snapper, spiced cheese, teriyaki sauce, and then baked. The melted spiced cheese tasted heavenly while the teriyaki sauce accentuated the sweetness of the crab and avocado inside. The tai (red snapper) was cut so thin that I almost forgot it was even there. Kami Sushi pays excellent attention to the presentation of their dishes and I noticed that the dishes served to the tables around me looked very visually appealing as well. The food was generally well-prepared and my dad approved of this Japanese restaurant, particularly because they excelled in their warm rolls (he doesn't like cold food). Despite being seated in one of the nooks and crannies of the restaurant, service was considerably attentive. Well, looks like I'll be back for more creative sushi!